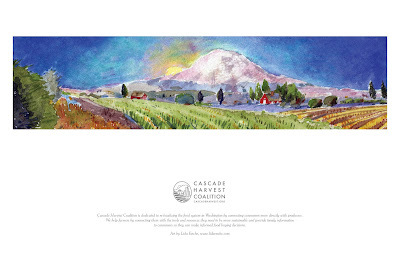 I am very happy to announce that my new poster is now available through Cascade Harvest Coalition, a non-profit that "works to keep farmers on their land, not only for our generation, but for those to come". Basically - they are really good people doing great work. For a contribution of $50 (go to the "Donate Now!" tomato in the upper right hand corner) they will happily send you your own print to frame. Please contact them if you have any questions... Thank you! Wow! I love this one! Very impressive. Thank you! This illustration was originally done for Puget Sound Fresh's email newsletter. It got such a good response from people wanting prints, the poster idea was hatched! I also have the same farm/vantage point in Spring, Winter and Fall. I will post those in the next few days.